Ultrasonictors are powerful blenders and homogenizers, whose application is not limited to lab and industry. 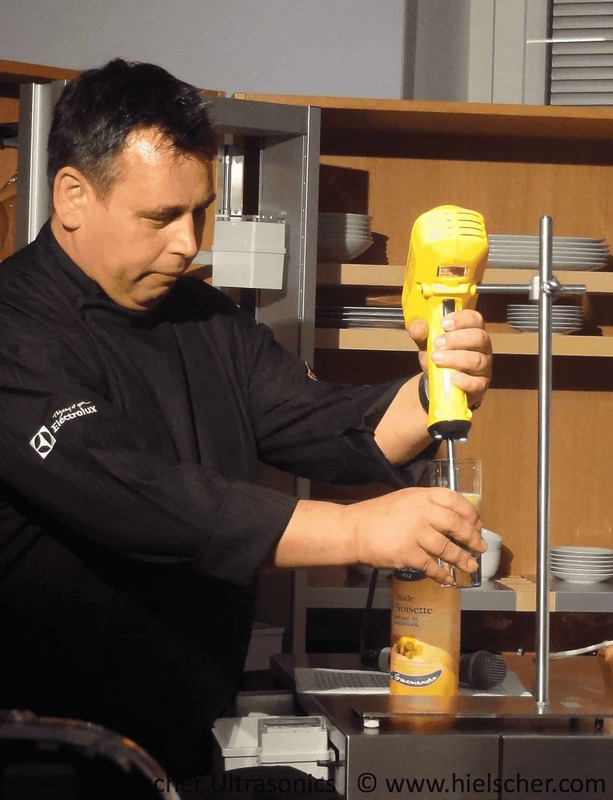 Since a few years, ultrasonicators have found their way into the gourmet kitchens, too. Prestigious star-arwarded gourmet restaurants, small gems of finest food, cooking school as well as amateur chefs use ultrasonic devices to explore the molecular cuisine creating unique dishes. Find below the basics of ultrasonic cooking and get inspired by ultrasonic recipes! Click on the bullet points below to read more tips and tricks about how to create ultrasonically inspired dishes! Ultrasonic waves applied to solid-liquid mixtures are a powerful and effective extraction method. 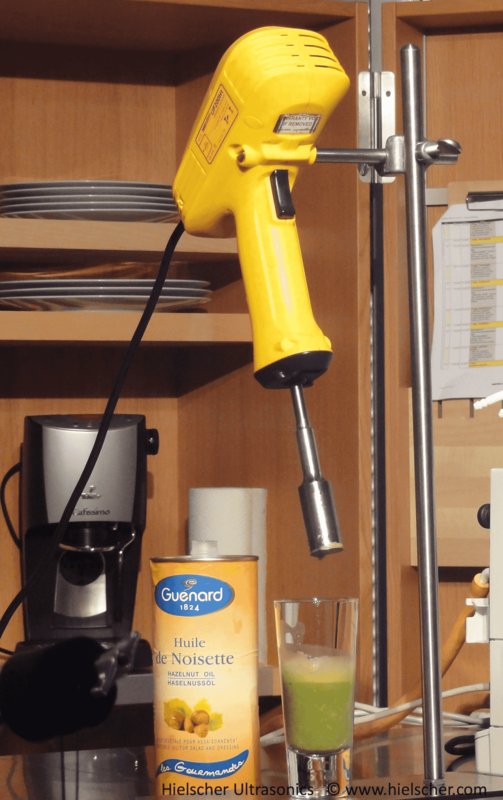 Try to cold-brew your cup of coffee with ultrasound! Depending on the strength you want to achieve, add 1-2 teaspoons (or more) of grounded coffee powder into a cup of cold water and sonicate. Remove the coffee powder afterwards by filtration through coffee filter paper. If you need the coffee as cooking or baking ingredient, use it cold. If you want to drink it, you might heat it up a little. Enjoy your cup of coffee! For a more scientific background of ultrasonic caffeine extraction, read more here! Ultrasound gives you the possibility to age wine, cider, spirits and liquors instantly. Either you sonicate an acidic wine or sharp spirit to smoothen its taste or you flavor wine or liquor by sonicating it with e.g. oak chips. Besides of aging, our ultrasonicators are ideal for making alcoholic infusions. Just add your flavoring ingredient, e.g. lavender, orange peel chips, crushed chili to your booze (e.g. vodka, white rum) and sonicate the mixture – preferably in an ice bath to control the temperature. After sonication remove the solid particles by straining. Ready is your home-made flavored liquor! For a more scientific background of ultrasonic wine aging, learn more by clicking here! 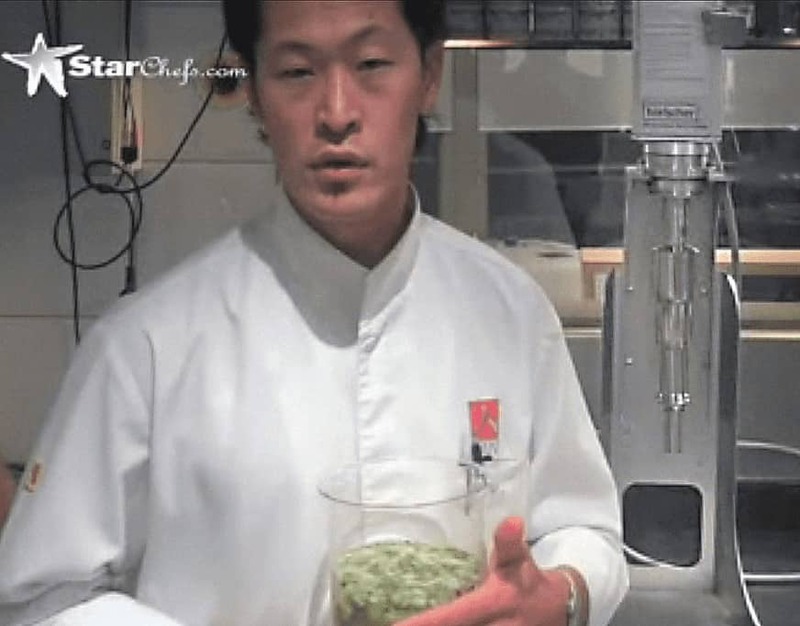 For the preparation of his creation Ultrasonic Shrimp Stock, the 2-Michelin Star awarded chef Sang-Hoon Degeimbre (L’Air du Temps, Belgium) sonicates all ingredients (shrimps, water, tomato puree, carrot, salt) at 50% amplitude for 10 minutes. To watch Sang-Hoon Degimbre’s video, please click here! Sonication provides emulsification and flavor extraction to enhance your gravy, sauce or marinade. Put the ingredients in a saucepan and let the mixture simmer for a few minutes. Fill the gravy in a beaker and sonicate for 60 – 90 sec. Strain through a mesh and reheat shortly to the boiling point. Ultrasound is well-known for its outstanding extraction effects. 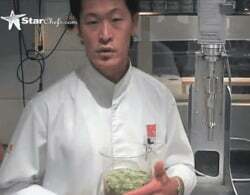 Put herbs, leaves, or flowers in your liquid that you want to infuse (e.g. water, alcohol, oil). 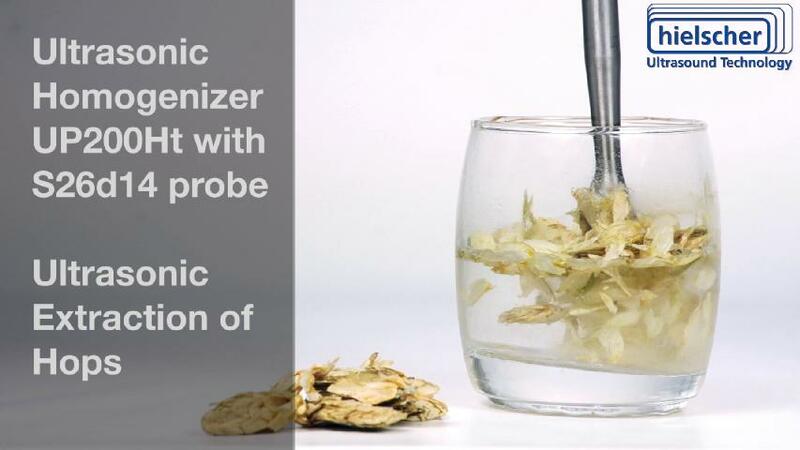 For an improved ultrasonic extraction it is recommended to macerate the plant material as smaller particles are more completely affected by the ultrasound. Sonicate, filtrate – ready is your infusion! Move the ultrasonic probe in the oil so that the plant parts will be evenly affected by the ultrasound waves. Ultrasound is a well-proven technique to create stable emulsions. As the ultrasonic cavitation shear droplets to micron- and nano-size, blending immiscible liquids such as oil and water together. Due to its outstanding emulsion performance, ultrasound is used for the preparation of vinaigrette, dressings, sauces and gravies. For 400mL of a vinegar-in-oil vinaigrette (W/O): Place the sonotrode in the beaker with oil and switch the ultrasonic device on. Add the vinagre gradually to the oil (e.g. ratio 1:3). For best effects, you can use a syringe and inject the vinegar directly into the intense cavitation zone beneath the probe. Sonicate the mixture approx. 20-40 sec. An ice bath for cooling is recommended. The vinegar droplets will be encapsulated in the oil phase so that the oil taste will be more dominant. If you want dominant vinegar flavor, follow the procedure below. For 400mL of a oil-in-vinegar vinaigrette (O/W): Place the sonotrode in the beaker with oil and switch the ultrasonic device on. Add the oil gradually to the vinegar (e.g. ratio 1:3). For best effects, you can use a syringe and inject the oil directly into the intense cavitation zone beneath the probe. Sonicate the mixture approx. 20-40 sec. An ice bath for cooling is recommended. The oil droplets will be encapsulated in the vinegar phase so that the vinegar taste will be the highlighted flavor. Click here to learn more about the ultrasonic emulsification and about its effects on the production of margarine! Mash the vegetable or fruits of your choice to a puree. If the puree is very thick, you might add some water, milk or oil. Then sonicate the mash moving the ultrasonic probe in the mixture for an even treatment. The ultrasound breaks the cells and releases all the flavors, nutrients and sugar from the cells. Thereby, a intense flavor and a thick, smooth texture is achieved. As all cell entrapped natural sugar is released by sonication, the addition of retail sugar or artificial sweetener can be completely avoided, which is especially important for smoothies and fruit purees. 500gr of roasted pumpkin and add 500mL of vegetable broth, 2 tblsp of cream and some condiments. Sonicate the mixture for 3-4 min. For an even sonication and a high release of gustatory substances, gentle stirring is recommended. Mix 1 egg yolk with a pinch of salt, add 1 tsp. of mustard. Sonicate the mixture and add slowly 8 tblsp. of oil, 1 tblsp. of lemon juice, some herbs and pepper. An ice bath for cooling and slight stirring are recommended to obtain a creamy, stable emulsion. Raw oysters are commonly served with a shallot vinaigrette or mignonette to season the shellfish delicacy. The recipe below makes a very fine shallot vinaigrette that seasons the delicate flvour of raw oyster, served classically on the halfshell. Poor ¼ cup of white vinegar and ¼ cup of white unseasoned rice vinegar in a glass beaker (optimally with a diameter of 2.8-3.9in/ 8-10cm). Place the glass beaker with the vinegar into a cold water or ice bath. Insert the UP200Ht with sonotrode S26d40 and sonicate the liquid mildly at 50% amplitude setting for 20sec, moving the sonotrode gently in the liquid to ensure an even ultrasonic treatment. Pause for 30sec and repeat the sonication procedure for 20sec. The ultrasonication of the vinegar results in a smoother, rounder taste as the acidity of the vinegar is lowered. Peel the shallots and chop them finely. Add the minced shallots, the freshly crushed pepper, sugar and salt into the glass beaker and stir it with a spoon. Sonicate the mixture gently a 50% amplitude for 30sec whilst moving the sonotrode slowly. Chill the vinaigrette in the refrigerator over night. Before serving stir the shallot vinaigrette up to remove sedimentation. 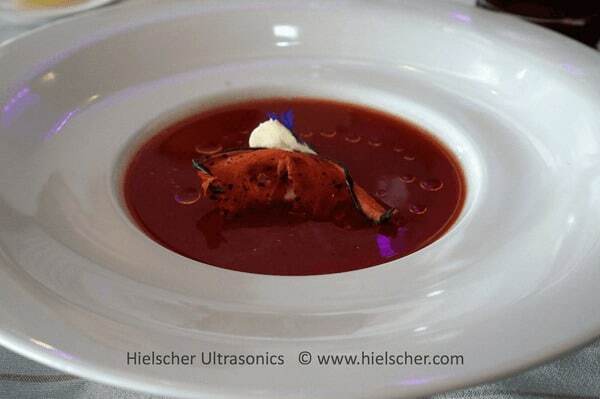 Prepare crunchy french fires – as known from the Modernist Cuisine – using your ultrasonic probe-type device. First, give your freshly cut potato sticks a short fry in the hot oil. In the second step, sonicate the fries at medium intensity. Make sure that you stir the fries in the oil now and then so that the ultrasonics can reach the surface of all fries. The ultrasonic cavitation creates non visible fissures and cracks the potato cells so that the starch becomes available. The extracted starch makes the potatoes extra crispy. After sonication, give the french fries a short second frying treatment until golden and crunchy. Remove them from the frying oil and drain on a paper towel. Enjoy your crunchy starch-infused french fries with ultrasonically prepared ketchup and mayonnaise! With ultrasound you can tenderize and marinate your meat within second. Sonicate your fillets of meat directly or place them in a marinade. Set a medium amplitude and use a larger ultrasonic horn. Move the ultrasonic horn slowly over the surface of the fillets. The ultrasound softens the filament and opens the pores so that the marinade can penetrate instantaneously. Ultrasonicators are ideal to blend thickeners and stabilizers like hydrocolloidal xanthan gum and guar gum into recipes. As ultrasonics create intense shear forces, even powders that are hardly miscible and tend to clumping, can be homogeneously blended into liquids. Xanthan gum and guar gum thicken up very quick, which makes it even harder to stir them into a formulation. Ultrasonic mixing gives you an very even and fine blend so that the xanthan or guar gum powder can enfold its full properties. This helps you to use less thickening gum powder. Add the xanthan or guar gradually under sonication to you sauce or gravy. Move the ultrasonic probe in the beaker to make sure that the powder is evenly sonicated and well mixed into the liquid. When you switch off the ultrasonic device, you can immediately observe the thickening effect. 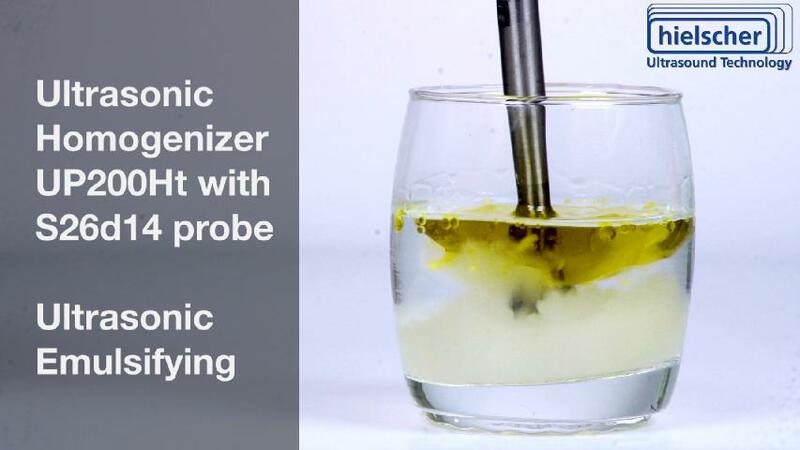 If you want to create a xanthan foam, just choose a probe with larger tip diameter and move the ultrasonic probe in the suspension of liquid and xanthan gum up and down. Whenever the probe is on the surface (almost over the liquid surface) of the liquid, air bubbles are entrapped, so that a light espuma is formed. Similarly to the ultrasonic aging of wine and spirits, also vinegars can be artificially aged by ultrasound. Reduce the sharp acidity and sourness of young vinegars sonicating the vinegar for a short period. Additionally, you can infuse the acidic condiment with flavors of your choose, e.g. oak, herbs, chili, or fruits such as raspberries. Add the chopped or macerated flavoring donor to the vinegar and sonicate. The longer the ultrasonic treatment, the more intense the flavor release becomes. Just do not over-sonicate to prevent a degradation of the raw materials. Drain through a filter paper. For a more scientific background of ultrasonic vinegar aging, learn more by clicking here! Hielscher’s broad product range offers smaller ultrasonicators for the use in a private kitchen of ambitious cooks as well as large ultrasonic homogenizers for highly professional chefs and their large gastronomy kitchen. Tell us your purpose – we are glad to recommend you a suitable device!